Do you know what granola is? It is a delicious option for breakfast or snack. How to make granola at home? We discover the ingredients and steps necessary to make this delicious preparation very rich in fiber, and also its benefits. When we look for foods rich in essential nutrients that are very complete, to enjoy a breakfast as healthy as nutritious, we can find a certain series not only of food but also of recipes that meet our expectations enormously. We can mention, for example, oatmeal and its great power both energetic and nutritious (if you want to discover more, you can read our special note of 4 delicious recipes with oats). But if you want to make a much more complete dish or food you can opt for other natural and healthy recipes. Noteworthy, for example, is the muesli, also made with oats, which usually includes nuts, dried fruits and milk or yogurt. What is granola, what is it? The granola is a delicious food formed by oat flakes and nuts, which are mixed with honey and other natural ingredients. Among these extra natural ingredients, we can mention raisins, dates and dried fruits. This mixture is baked until it becomes a wonderfully crunchy food. During the cooking process, the mixture of oats, nuts, and honey is stirred in order to maintain the consistency typical of the cereals that are usually consumed at breakfast and to avoid above all that the mixture is caked. It is a mixture of ingredients that was originally created in the year 1863 by the American physician James Caleb Jackson, who at that time called it the “granula”. As we see, it is a healthy and really wonderful option to opt for a nutritious and delicious breakfast, especially if we make it ourselves at home, knowing that we use one hundred percent natural ingredients. 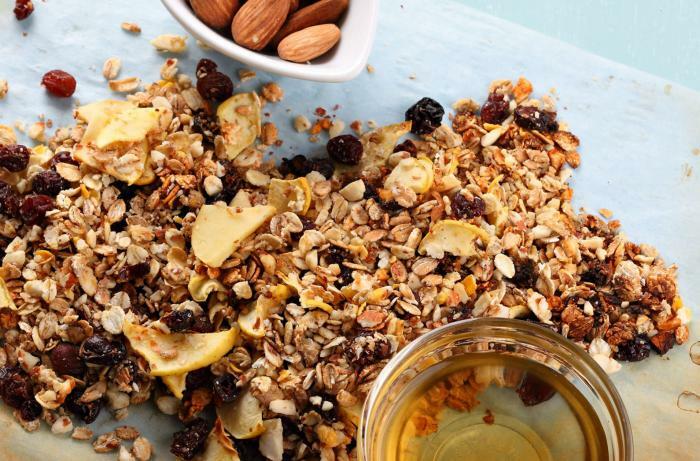 How to make granola at home? 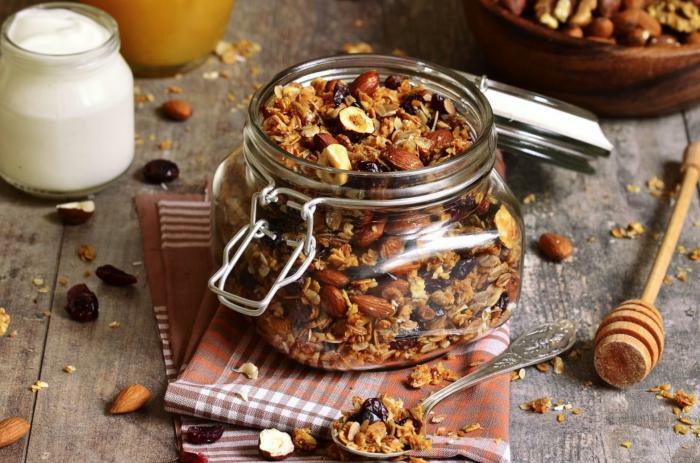 To make the granola at home you need: 3 cups of oat flakes, 1 cup of sliced almonds, half a cup of chopped nuts, half a cup of chopped pecan nuts, 1/4 cup of sunflower seeds, 3/4 cup of raw pistachios , 1 tablespoon of sesame seeds, 1 tablespoon of flax seeds, half a cup of raisins and half a cup of honey. First, preheat the oven to medium temperature. Place a silicone sheet or baking sheet on the baking tray, or in a long baking dish. In a large bowl put all the ingredients, except honey and mix everything well. Now place the mixture in the oven tray, forming a thin layer. Add honey on top (for this the honey should be liquid, in case you are not able to introduce it a bit in the microwave), avoiding mixing it so that granola balls do not form. Bake for 30 minutes at a gentle temperature. Every 10 minutes, to prevent the mixture from burning, stir but gently. After 10 minutes remove from the oven and let cool. Then add the raisins on top. You can store it in an airtight container, and keep it for a month.